29th April 2014 Adrian Marwitz continues a family history that has been synonymous with German eyewear since 1918. The brand was created by Marwitz’s grandfather, and Adrian is delighted and excited to guide the brand into the new millennium, with his passionate belief that eyewear is the ultimate fashion accessory. Marwitz frames are streamlined and sleek, uncluttered and pure, and feature first-class manufacturing processes – everything is handcrafted in Germany. 25th April 2014 Cesare Cunaccia is a true 21st century Renaissance Man. He is editor-at-large for Vogue Italia and L’Uomo Vogue, plus an expert in fashion, costume, art and design. Cunaccia’s latest achievement is a collaboration with Boudoir, the elegant eyewear gallery in Venice owned by Alessandro De Lorenzo (above) for whom Cesare has created exclusive designs, handcrafted in luxurious Water Buffalo horn. The eco-friendly horn is recommended for people with metal allergies, as it is totally natural. 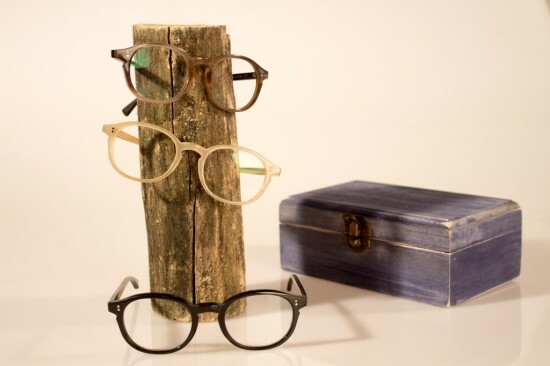 The contemporary shape of the frames re-enforces the distinctive beauty of genuine Buffalo horn. The designs are little masterpieces of Italian craftsmanship. Photo of Alessandro de Lorenzo exclusively for Eyestylist by Luca Santocono. All rights reserved. 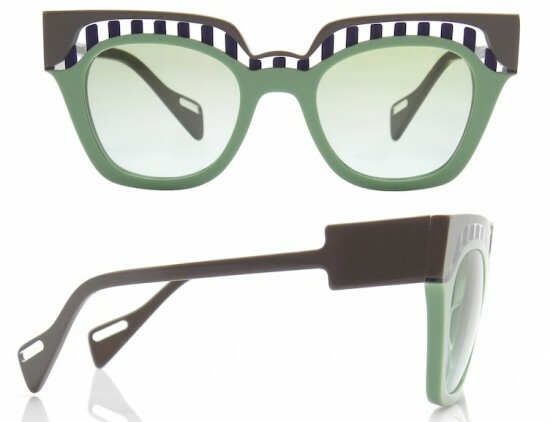 18th April 2014 As well as the ongoing trend in personalising eyewear – we have spotted some beautiful personalised accessories including these by Bushakan – makers of sustainable storage for eyewear, phones and iPads. 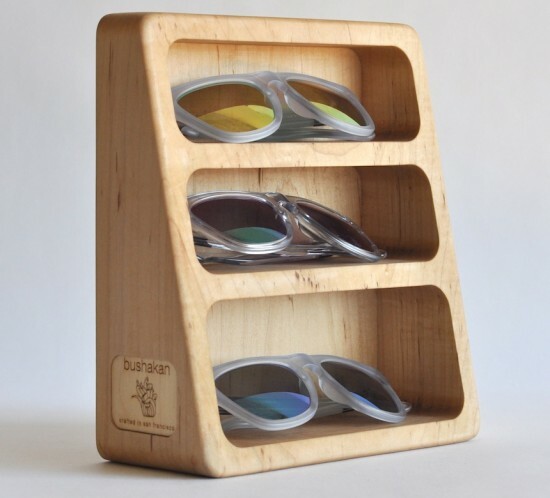 The label, which is based in San Francisco, produces solid walnut or maple three and five piece eyewear stands, iPhone and iPad docks which can be engraved with a logo, name or initials. Each design starts as a solid piece of wood, sourced from sustainably managed forests, and in the final stages, finished by hand. (Above: Bushakan 5 pocket storage, below, 3 pocket design). 11th April 2014 Anne & Valentin has us marvelling again at the delectable details of Open Pop, a new collection with a gorgeous colour concept that plays with transparency and retro colour ‘pops’. Inspired by Lichtenstein, William Klein’s visions of pop culture and the geometries of the 60s, the Open Pop concept is light, airy and excitingly sassy. Model ‘Op La’ is one of several shapes in the line – oversize and boldly geometric, with graphic lines and a striped resin inlay that gives a couture definition to this statement eyewear. The temples have been cut to go from bold and thick to delicate and thin, creating a floating effect when on the face. 7th April 2014 Brilliant shades of blue are a highlight in many collections this season – stunning, rich tones in exciting variations. The intensity of the colour is a nod to the famous deep blue hue created in 1961 by French artist Yves Klein, with input from a chemist – a colour that Klein often used in his paintings. International designers offer delightful interpretations – here are Four Beautiful Blues! 4th April 2014 Certain designs are timeless – indeed, they improve with age. Silhouette’s FUTURA is an iconic frame that transcends the years. Futura was introduced in 1974 (above); then there was a retake on the cult frame in 2004. The latest reinterpretation is the Futura 2014 to coincide with Silhouette’s 50th Anniversary. “Thanks to Silhouette’s special material technology, the new Futura moulds itself completely to the head, appearing to almost hover on the face,” said designer Gerhard Fuchs. 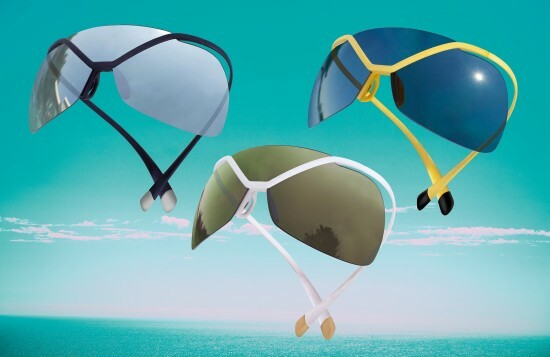 The exceptionally stunning frame is available in three energizing colours: a black temple and silver mirrored lenses; a white temple with bonze-colour mirrored lenses; and sunny yellow with black lenses. 1st April 2014 Francisco Avilés and Thomas Denizot’s boutique-style shop L’Atelier Óptica is the kind of place that Madrid excels at: a stylish retail space inside a charming old building in one of the city “barrios” or quarters – Barrio de las Letras – well-known for its art galleries and antique shops. Natural brick walls, cement flooring and neutral colours are complimented by plants, mirrors and bright hanging lights in a fashionable, serene arrangement that the Spanish do so effortlessly. Perfectly coordinated design features include accessories, lighting and furniture by Vitra, Flos, String, Habitat and Norman Copenhagen. Also featured are works by Eames, Konstantin Gcic and Egon Eiermann. 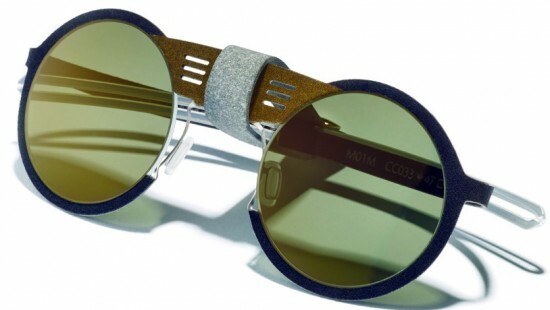 Opened just 4 months ago, the shop highlights fine independent labels including Mykita, Massada, Vue DC and some Eyestylist favourites: British labels, Fan Optics and Claire Goldsmith and from Portugal, Paulino Spectacles. 1st April 2014 Hapter was created in the Italian Dolomite Mountains in January 2013 by founders Eric Balzan and Mirko Forti, when they launched the txt1001 collection, featuring a trademark tactile expressiveness obtained by a special fusion of surgical steel to high-end textiles. Balzan and Forti share with Eyestylist how they created and are developing their business. Before the discovery of the amazing goggles, in what profession were you working? 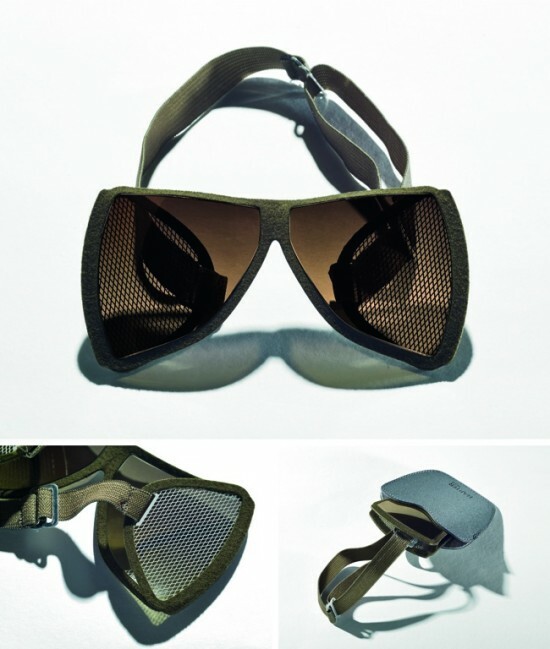 “Mirko brings on board several years of solid experience designing for some of the big players in the eyewear business. Trained as an Industrial Designer, he is in charge of product development, and is the technical side of Hapter,” says Eric. Please tell us about your background and love of mountain climbing? “Brand: We chose the name Hapter by the concept of ‘Haptic Perception’ which is the process of recognizing objects through touch: hands are still the most important body-part to survive in the mountains, and observing the strong hands of mountain people is an experience in itself. Design: The Dolomite region, in the far north of Italy, is an historic military battle front, but this for us also represents a land of integration between varied and symbiotic cultures. In Hapter, we combine the rigorous structural concept derived from a Nordic engineering background, and the artisanal know-how and flair of Mediterranean expressiveness. What is the profile of the Hapter customer? Photos: Top photo of Mirko Forti and Eric Balzan, and image of the heirloom goggles by Luca Santocono exclusively for Eyestylist. 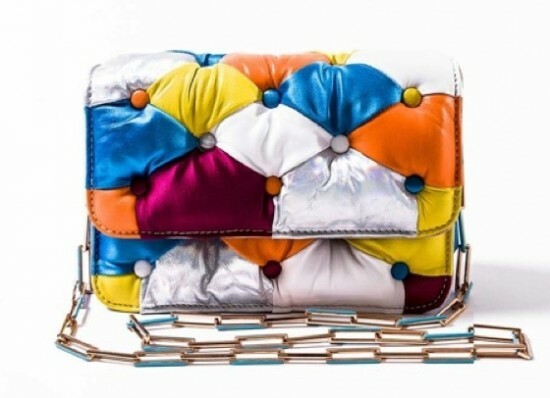 1st April 2014 Accessories across the spectrum from shoes, to bags to sunglasses reflect fashion’s love affair with ocean hues, from pastel acquas to bright teal or deep turquoise, in blocked colour or intricately patterned or textured with delicate detail. Eyestylist.com has picked some personal highlights…. 1st April 2014 Fashion from the post-war 1940’s period to the current day are highlighted in The Glamour of Italian Fashion 1945-2014 at London’s Victoria & Albert Museum. Sponsored by Bulgari, fabulous heritage jewels once owned by Elizabeth Taylor are also on display. Creations from designers synonymous with Italian artisanal tradition include Giorgio Armani, Valentino, Missoni, Versace, Gianfranco Ferre, Mila Schön, Simonetta, Prada, Pucci, and Dolce & Gabbana among others. The exhibition traces Italy’s rich and influential contribution to fashion – a contribution that extended around the world, and particularly influenced film stars like Audrey Hepburn and Elizabeth Taylor, who became style ambassadors for luxurious Italian clothing. The Glamour of Italian Fashion focuses on the exceptional quality of techniques, materials and expertise for which Italy has become renowned. The country’s status as manufacturer and exporter of stylish and well-made fashion and textiles is linked to the strength of its traditional industries including spinning, dyeing, weaving, cutting and stitching; some of these traditions have been practised in regions around Italy for hundreds of years.